Ever since a squirrel ran across home plate in the 5th inning of Game 4 of the 2011 NLDS at Busch Stadium, the 'Rally Squirrel' became a hero for Cardinals fans as they went all the way to win the 2011 World Series. 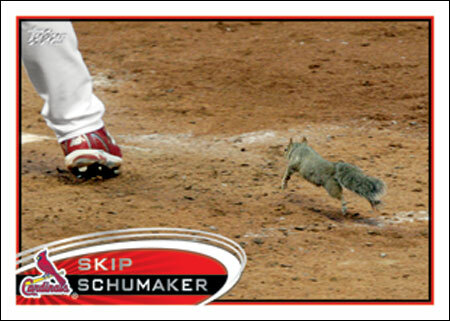 And now the squirrel will be memorialized with its own baseball card, that of Skip Schumacher's, whose leg is in the picture, as you can see below. Don't tell me that that is not fantastic.